Harrison recorded two tackles during Sunday's season finale in Green Bay. Harrison (ankle) is listed as active for Sunday's game against the Packers. Analysis: Harrison played through the ankle issue in Week 16 as well, logging 39 defensive snaps en route to five tackles (three solo). He'll look to shut down Jamaal Williams and the Packers' rushing attack during the Lions' season finale. 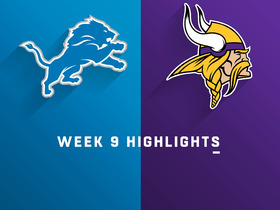 Harrison (ankle) is active for Sunday's game versus the Vikings, Tim Twentyman of the Lions' official site reports. Analysis: The run-stuffing defensive tackle will avoid missing his first game since entering the league in 2012. With 13 tackles over the final two contests of the year, Harrison could surpass his previous career high of 86 tackles. Harrison (ankle) is questionable for Sunday's game against the Vikings. Analysis: Harrison didn't practice the first two days of the week but was a limited participant Friday to earn the questionable tag. 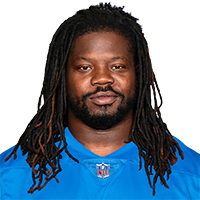 The 30-year-old saw a season-high 52 defensive snaps in Week 15, and his absence would represent a major blow to the Lions defense. Harrison (ankle) did not practice Wednesday. Analysis: Harrison suffered an ankle injury during Sunday's loss to the Bills, putting his Week 16 status in question. If the starting defensive end were unable to play against the Vikings on Sunday, A'Shawn Robinson would likely slot into the starting lineup. Harrison notched seven tackles, one sack, one forced fumble and one fumble recovery during Sunday's loss to the Rams. 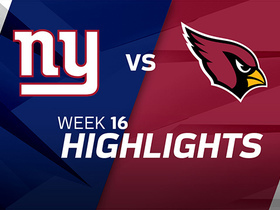 Analysis: Harrison continues to make the Giants look silly for trading him for a fifth-round pick, as the 30-year-old vet continues to be a force in the run game and has now set a new career-high with 3.5 sacks on the season. 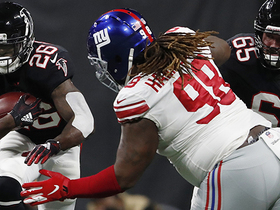 However, the nature of his role on the interior of the line will continue to make him a low-floor, high-upside IDP option among defensive linemen. Harrison had three tackles and 1.5 sacks in Thursday's loss to the Bears. 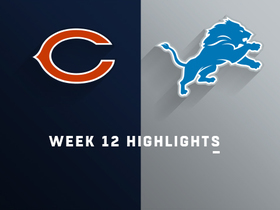 Analysis: Harrison was his usual run-stuffing self against the Bears but also registered three hits on the quarterback, including the 1.5 sacks. The 29-year-old's season total of 57 tackles serves as evidence that he remains one of the best run stoppers in the league, but his real-life value continues to dwarf his IDP appeal. Harrison (shoulder) is listed as active Thursday versus the Bears, Tim Twentyman of the Lions' official site reports. 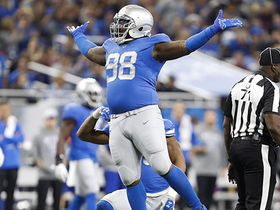 Analysis: For a second straight week of prep, Harrison contended with a shoulder injury in practice, but the defensive tackle nonetheless will make his fifth appearance with the Lions. In the previous four, he totaled 20 tackles (17 solo) and one sack while notching between 33 and 39 defensive snaps per contest. Harrison (shoulder) is active for Sunday's game versus the Texans. Analysis: Limited in practice this week by a shoulder injury, Harrison will tough it out as he looks to uphold the lofty standard from his first three appearances as a Lion. During those outings, he turned 35.3 defensive snaps per game into 20 tackles, including one sack. Harrison (shoulder) carries the questionable tag for Sunday's matchup with the Panthers. Analysis: Harrison has made a big difference for the Lions' defense, recording 20 tackles (18 solo) over three games. The former Giant practiced in a limited capacity each day this week. 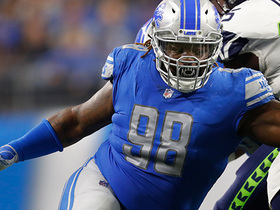 The Lions will likely need Harrison on Sunday with fellow defensive tackle A'Shawn Robinson (ankle) already ruled out, a development that leaves Ricky Jean Francois as the only healthy defensive tackle. Detroit Lions defensive tackle Damon Harrison overpowers Los Angeles Rams quarterback Jared Goff for strip-sack. Chicago Bears quarterback Chase Daniel is sacked by Detroit Lions defensive tackle Damon Harrison and defensive end Romeo Okwara. 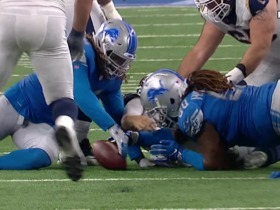 Detroit Lions defensive tackle Damon 'Snacks' Harrison gets first sack with the Lions in Week 8 vs. the Seattle Seahawks. 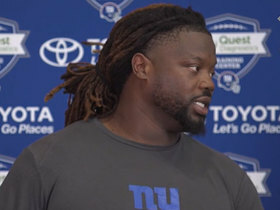 NFL Network Insider Ian Rapoport breaks the news that the Giants are trading defensive tackle Damon Harrison to the Lions for a 5th round pick. 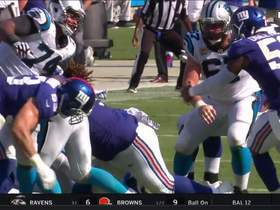 New York Giants defensive tackle breaks through the offensive line and wraps up Carolina Panthers running back Christian McCaffrey for a loss of yards. New York Giants defensive tackle Damon Harrison doesn't have anything against new temmate Will Hernandez. 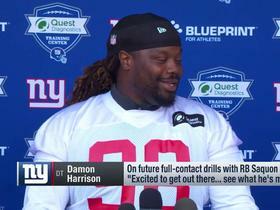 New York Giants defensive tackle Damon Harrison and rookie running back Saquon Barkley discuss their friendly practice rivalry.